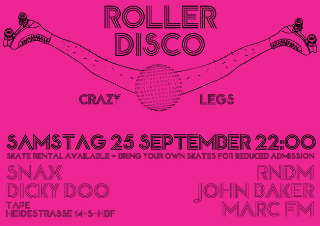 Saturday night, 09/25, Snax will be on the decks for what will surely be a memorable night out in Berlin…the first Crazy Legs Roller Disco party at Tape Club (Heidestrasse 14)! Come on down and prepare to rock and roller boogie. Bring your own skates (for reduced admission!) or rent a pair there. More info at the Facebook invite. Let’s rock, let’s roll…let’s skate!! We’re trying to identify that roller-boogie song with the refrain “Let’s Rock, Let’s Roll, Let’s Skate!” Can’t find it anywhere on the internet. Any idea?? That fierce track is called “Roller Rink Funk” by Shift. It was released on the classic New York disco label, P&P. I got it on a comp of theirs called Super Disco. Look for it!